An Australian I’d never heard of recently took a vacation to Papua New Guinea—a country just a few miles off the northern tip of his home state of Queensland. One of the places he wanted to see was Milne Bay, the site of the 1942 battle in which his grandfather had fought. 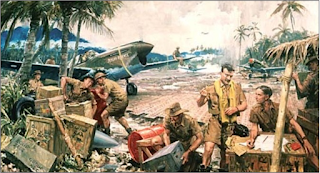 Most Americans haven’t heard of the Battle of Milne Bay, but it was the first time the Japanese were defeated on land; and Australians believe that if the Allies hadn’t won that one, an invasion of their own country was next. 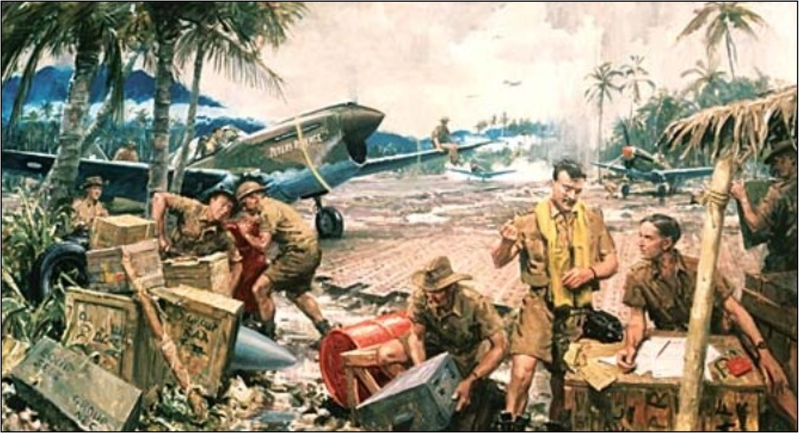 Therefore it was mostly Australians who fought for the Allies in Milne Bay, but there were also two American battalions alongside them. Though I didn’t know it until just a couple of weeks ago, my dad’s Uncle Fred was in one of those battalions. Fred was much beloved by the family, and my mother remembers him as one of the nicest people she knew—so maybe it should be no surprise that he was not cut out for the ravages of war. When he returned home, he, like a couple of other great-uncles on my mother’s side who’d fought in World War 2, succumbed to the disease of alcoholism. His body died suddenly on the street when I was just a toddler, and I think his memory was set to die with the generation that preceded me. That is, until this kind Australian stranger took a cruise to Milne Bay. And there, buried in the sand of a beach on Kiriwina Island, he found something made of metal. Digging it up, he saw that it was a military dog tag. After cleaning as much of it as he could, he was able to read what was written on it: the name Fred R. White. This must’ve been a very common combination of names back then, but this particular dog tag was issued during the brief period when the U.S. military also included the name and address of the next-of-kin on dog tags. And so printed there was not only the common name Fred White, but also his mother’s name, Belle White of 3619 Short Street in Catlettsburg, Kentucky. Belle was my great-grandmother, whom I remember very well. With this information, my new Australian friend was able to find a very distant cousin of ours, who then found my sister who put me in charge of repatriating our Uncle Fred’s memory. When I read the story in the Bible of a childless patriarch who is promised by God that his descendants will be as countless as the grains of dust on the earth, I cannot help but relate this to the story that’s currently playing in my head of my childless Great-Uncle Fred whose life lay as hidden from view as that 74-year-old dog tag in the sands of an island I’d never heard of on the opposite side of the globe. When a life is pulled out of the dirt, I can’t help but see God’s hand in it. And sometimes, I have to admit, finding God is as difficult as finding something buried beneath the sand on a deserted beach. And as present as God often seems to be in parts of Abraham’s story, God is indeed hard to find in other parts. Abraham had faith, but he did not have good works—at least not all the time. Abraham was clearly a flawed human being; and if we read his story through the lens of modernity, we see a coward, a slaveholder, and an abuser. And so with that, I’m going to use the Bible to say and do something that the Bible clearly doesn’t intend. But that’s okay, because I think I’m still being true to the scriptures. Exodus and resurrection trump chapter and verse. What I mean by this is that the Bible has grand themes that promise freedom for those in captivity and acceptance for the rejected. This is what happened at the Red Sea and at Calvary. We can still find individual passages in the scriptures which seem to speak with a different voice. And because these passages are often very brief, it’s easy to turn them into sound bites. And we all know about sound bites: there are always a lot of people who want to eat them up. To understand the grand themes of liberation and inclusion, you have to read whole books of the Bible. You have to pray. You have to think. But hatred and subjugation and exclusion don’t require any of those things. All you need for that is a few sound bites. The reason I’m bringing this up now is because right there in the story of Abraham, we hear an uncritical reference to slavery. This isn’t the only one in the Bible. There are several. And they’re easily memorized. But these verses lift no hearts, nor have they ever inspired any hymns. If we want to understand what’s really going on in the story of Abraham, let’s first look at how we view our own surroundings. Now everybody here knows that I think quite highly of my small dog Brewster Meese. But as good and smart as I want to think Brewster is, he is utterly indifferent to the beauty of his surroundings. I can take him for a walk in the canyon and he never even notices the view. He’s very concerned about other animals and any chance that there might be food somewhere. But sunsets are of no interest to him. And we’ll not discuss how his appreciation of trees differs from my own. This is not unlike the two different times when God asks Abraham to look and count. The first time, Abraham was told to look down and try to count the grains of dirt—and dirt is, after all, the Bible’s metaphor for where we come from. But by the end of the passage, Abraham is told to look up and try to count the stars—and in the ascension of Jesus, Christians believe that the stars are our ultimate destiny. 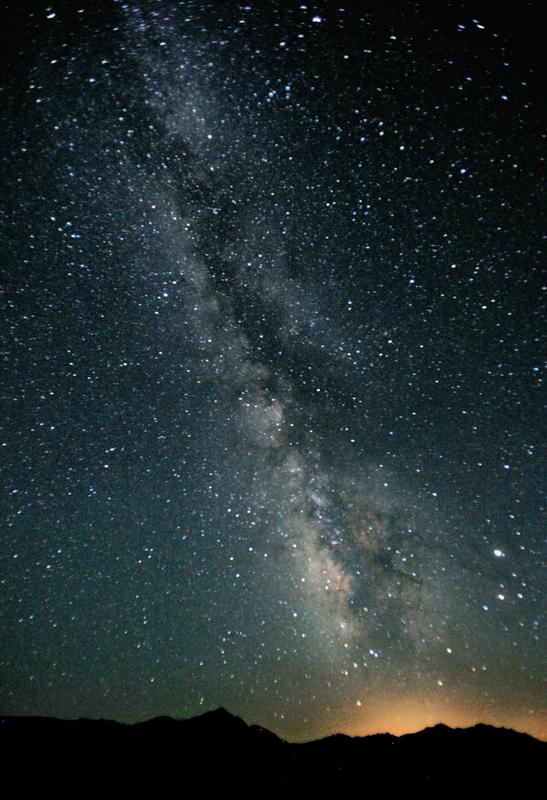 Infinity is implied in both the grains of sand under our feet and the number of stars above our heads, so both promises are the same in quantity. But in quality, they are very different. I think that’s how God tries to teach us to rise above the meanness of chapter and verse to view the grandeur of the Bible’s nobility; to understand that we are delivered from laws that exclude and restrict into the broad place of liberty and acceptance. The Bible contains both law and gospel, but the purpose of the former is to bring us to the border of the latter so we can decide if the good news sounds good to us. It’s not easy to profess the faith of the Bible and to live the gospel of Christ. That’s because they sometimes seem to stand in contrast to each other. There have been times when we have had to leave some words in the dust in order to reach for the stars. We can’t deny that those words are there, but we can put them in their proper place. But our proper place is not, as Ogden Nash put it, “where our birth certificates sat us,” but rather with the God who lifted Abraham’s eyes from the earth to the skies, who redeems the lives of those who have been forgotten in the dust, and who makes us citizens not of one of earth’s nations, but of the Kingdom of Heaven. This way of illustrating the text was inspired by Alexander Maclaren (1826-1910), Expositions of the Holy Scripture: Genesis, Exodus, Leviticus, and Numbers. See ccel.org for complete text. You’re a foreigner, say in Rome. Is abroad when he’s where you’re at. But also a change of status. And the next may find him foreign. And the natives there, as aliens. But to foreigners you’re just a foreigner.